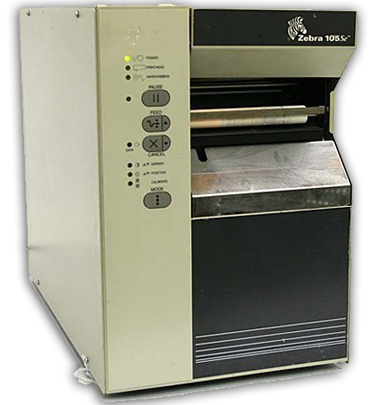 Z e b r a’s 105S e™ is an economical, high-quality bar code printer for general purpose labeling applications. It is one of the most versatile printers available, capable of meeting the needs of first-time or experienced users. With a variety of options, the 105S e can easily be configured to your requirements. And with Zebra’s renowned quality construction, you can be sure that it will withstand tough environments. The 105S e offers a 4” (101mm) print width and a wide range of print resolutions: 152, 203 or 300dpi. With 203dpi (8 dots/mm) standard, the 105S e w i l l accommodate a diverse range of commercial and industrial applications. Choose the optional 300dpi (12 dots/mm) printhead, and the 105S e can easily print small text, graphics and bar codes. And for printing UPC and EAN symbols at 100% magnification, choose the 152dpi (6 dots/mm) printhead. If long or graphically complex labels are required, memory can be expanded to 1MB (standard on the 300dpi model). With an optional full-width cutter, the 105S e will cut labels and tags individually or in strips. And, if you want to print labels in high volumes and in batches, choose an optional internal rewind feature to rewind a full 8-inch roll of labels within the printer.